Up Close! : The Suarez's team up! Finally....finally, we are now together...living together...helping each other. We never knew what its like to be together, because we are used to be just saying "hi, hello, good bye and see you later!" I remember the time when I was brought by a friend to a church to attend a youth fellowship and there I met a lot of other young people. Yet, I don't know if I ever saw him there. But, after that i found myself phoning their home asking for his whereabouts because i was given the task to follow-up the youth through phone. Then eventually I became a youth leader and the more that i do the youth pastoral care... and still it never came to me that someday i would be marrying him. Then...there came this one day that seems our friends are soo busy and there's none but the two of us left. Our long or probably not that long compare to others love story begun. We pass through a lot of testing (people from the church....leaders... friends...families.) and a lot of separations too. When our leaders found out that we are in a relationship they sent him to one of our outreach church 3-4hrs drive from Makati and we only see each other once a month and he'd been there for three months. After the period of time he was sent away some our leaders was planning to send him to that place again for good...and it was terrifying to us. But, we appeal to the Lord....and He came to our rescue but after awhile God sent him to Luton, England instead for four long months... but this one is not that hard (nor easy too) because we already have a covenant with the Lord. Then when he came back from England, we formalized our engagement and the Lord again told us to wait for two more years before getting married. I could still remember my conversation with the Lord about our wedding, way back summer 2005. I was walking along arellano st. in Palanan heading back to our missions house from my ministry area, asking the Lord if it is okay with Him if I will get married that same year or the succeeding year...I could still remember very clearly what the Lord told me about it. He said; it's okay if you really want to...go ahead I will still bless you. But..., don't expect that the things you wish and hope for will happen. It would just come if you wait. Then,I have moments of silence...and decided to wait upon His perfect and beautiful time instead amidst of kinda broken heart. But I really and surely knew in my heart that I am very right with my decision. 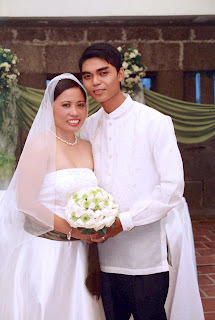 And two years after or to be exact on June sixth two thousand and eight with the full blessings of the Lord we get married at Casa Blanca, Intramuros Manila. We have no enough money for this very beautiful day of our life, but God provided us with everything. The things as well as the friends we hope for to be there on our wedding indeed came. We were so happy and blessed. But we give God the glory and honor, and we also give thanks to all our friends who helped us through. May God bless them as well more than they have ask for or imagine.